ENGINEERING - Mentor Radio, LLC. Technological advancements have changed the marketplace from simple product based solutions to completely integrated system solutions. Providing these systems require a broad range of expertise that is difficult for many companies to staff and maintain. Mentor Radio helps companies provide solutions to these challenges. We offer companies everything from low-volume, high quality products to high volume, low-cost products for commercial, medical, and military applications. Mentor Radio brings mature business judgment and experience to help you sort through your greatest engineering challenges and will help you meet your business objectives. Mentor Radio can translate your ideas into usable profit generating products or provide solutions for your design issues. We provide consulting services for a broad range of engineering challenges. Let us analyze and troubleshoot your design issues. 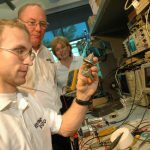 Mentor Radio has over 60 years of combined communication system design, development and testing experience, specializing in providing custom electronics, firmware, software, and fiber optic solutions. Mentor Radio Helps you Solve your Design Challenges…Call Us Today!